On October 10, 2010, the nearly-30-year-old-at-the-time My Little Pony franchise re-entered the world stage in the form of a new animated television series called My Little Pony: Friendship is Magic. The line of toys and animated features had seen numerous reboots over the years to varying degrees of success (or non-success), but there was something very different about Friendship is Magic: something about the show captivated not just its target demographic of 4- to 7-year-old girls but also men and women of all ages, races, religions, and socioeconomic situations. Since then, fans of the show (the “bronies”) have produced countless pieces of fan art, organized thousands of local meetups, established several substantial charities, and have put on hundreds of conventions across the globe, all centered around a show about pastel-colored ponies learning about the magic of friendship. What about this show holds such an appeal to so many people, especially those who fall well outside of its intended demographic? While this question has been asked and answered hundreds of times by bronies and non-bronies alike over the years in the form of analysis videos, documentaries, and even off-Broadway musicals, it is still a question that is worth asking. Here at the My Little Pony Rewatch Project: Deconstruction is Magic, we’re going to try and deconstruct the series in hopes of uncovering what it is that has drawn so many into this giant group hug. Back in 2011, I had the great opportunity to finally meet a friend I had known since 2003 from the Lion King fandom at the Midwest FurFest convention in Chicago, Illinois. One evening she informed me of a My Little Pony: Friendship is Magic panel that was going on and encouraged me to attend it with her and her friends. Prior to that point my knowledge of MLP:FiM was limited to a few random image macros that I had seen floating around on the Internet and a vague understanding that “it was a thing,” so I figured this would be a great opportunity to learn a bit more about this phenomenon. This was right after “May the Best Pet Win!” (S2E07) had aired so I was coming into the middle of this thing amid a huge mass of well-entrenched fans. My initial reaction was mixed: I enjoyed it, but I didn’t really feel any major draw to it because I had not yet formed any emotional attachments to the show’s characters. Several weeks went by where I didn’t really think much about it, but then on a whim I decided I’d start from the beginning and see whether the show would be something I’d like to catch up on and then follow. And as is often the case with so many other bronies, after watching several episodes I got hooked! I’ve never been into the whole business of (over)analyzing movies or television shows, particularly when it comes to MLP:FiM: it’s been done so often that by this point it’s really (ahem) beating a dead horse. That said, I am curious as to what it is that draws me so closely to the show, and by participating in this rewatch project I hope to learn a bit more about it. My gut feeling right now is that it’s the show characters and the brony community itself that holds the most appeal to me; we’ll see if that changes or expands as we re-watch each episode from the beginning! Full disclosure: my deconstructions will probably have a bit of a slant to them since the show is so important to me, but I’m going to make an effort to be as objective as possible. 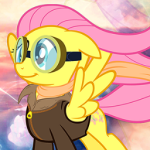 Fuller disclosure: Fluttershy is adorable and this may make the aforementioned objectivity difficult at times. Hey guys, Tessa here! Sometimes-podcaster/blogger but mostly just all-around goofball on the internet (to anyone who followed Noel and I here from Deconstructing Moya, hi! Hopefully we can make this just as entertaining for everyone). I guess I’m the MLP veteran out of the group, since my start with the franchise was all the way back in the 80s with G1 and G2. While I dunno if I’d have counted as a die-hard fan as a kid, I have very fond memories of watching the show and playing with the toys with friends, but eventually grew past it. I was vaguely aware of G3 and 3.5 being a thing (and still found the toys somewhat appealing but never quite got my interest caught to the point of diving back into the show). The G4 reboot (more commonly referred to as Friendship is Magic) came at an interesting time for me. Stuff was happening in my life that had me kind of in a slump, and sort of at the bottom of said down period was when a friend called my attention to the fact that the series had been rebooted again. Out of curiosity I watched the most recent episode off The Hub’s website (which that week was Suited For Success) and instantly fell in love with the change in the art style, the music, and the humor. At the time it was just a case of “omigosh this is so cute”, but soon after I wound up digging back into the beginning (which wasn’t too far back, since it was only halfway through Season 1 at the time), and very quickly became completely hooked. Since then I’ve wound up interacting to various degrees with the fan community surrounding the series, and been guilty of way over-analyzing and digging into the various episodes. So when we finished up the Farscape project and I wanted another series to dive into for a rewatch project, it seemed like a pretty good fit. I’m probably in the same boat with Gerf in that it’ll be a little tricky to stay objective on occasion (certain episodes it’s just going to be impossible for me not to spend the entire time gushing and fangirling), but I’ll do my best! Hi, I’m Noel. I’m a blogger and podcaster. I’ve done some stuff. My history with My Little Pony is that I have no history with My Little Pony. Which is why the others have me here, to explore this world and series as a fresh-eyed noob who likely has no clue just what he’s in for. I have seen a single episode of My Little Pony: Friendship is Magic, something involving a party and young ponies bummed that they haven’t developed their cutie marks yet (please restrain your desire to say which episode it is – let me find it when we get there). The writing was sharp, good characters, nice themes, and I’ve always had a soft spot for the sleek, flat fluidity of Flash animation. I just never got around to checking out additional episodes. While I never followed it regularly, I have seen a handful of episodes of Lauren Faust’s previous series, Foster’s Home for Imaginary Friends, and appreciated both its intelligence and imagination, which far too many children’s shows struggle with, more often than not. I hear a similar level of thought carries through here. Sorry I don’t have more to say, but me having so little to say about my relationship with the show is kind of the reason I’m here, to leave me open to everything that’s about to flood in. I’m very much excited and looking forward to the experience, and many thanks to Tessa and Gerf for inviting me along. Deconstruction is Magic will begin Saturday, July 5th with the first episode of Season One, “Friendship is Magic – Part One”.